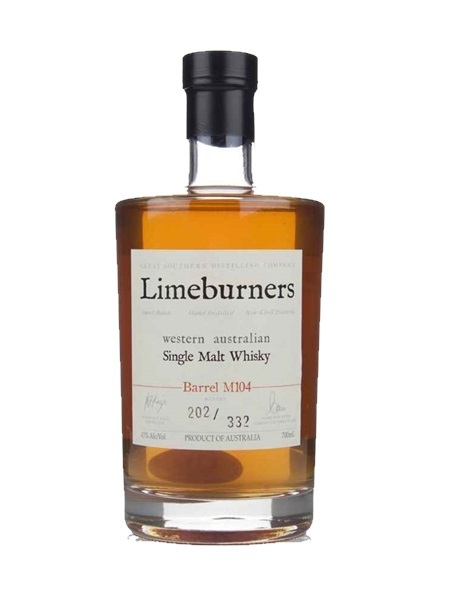 Limeburners Single Malt is a whisky from Albany in Western Australia. The Great Southern Distilling Company was founded by Cameron Syme in 2004 with commercial production beginning in 2005. Along with a range of single cask whisky releases, they produce gin, vodka, brandy and liquers. They have won numerous awards and in 2015 they opened a second distillery in Margaret River, WA. Limeburners Barrel M104 was finished in an Australian fortified wine barrel. 322 bottles were produced. It's non-chill filtered and bottled at 43% ABV.